Here’s the thing. There are no quick solutions for adapting behaviour or training our dogs. It’s not like Dr Who — you know, press the red button and the Daleks are exterminated. No — helping your dog takes TIME. If you accept this simple fact, things will be clearer. I see many people when I am out and about that fail to recognise the importance of time, consistency and repetition when trying to help their dogs. My dog is frightened of people and other dogs so I always keep him on the lead and away from the things that frighten him. The dog that never comes back has run off a couple of times and the owner has spent an hour looking for him. Therefore, he can’t be trained in recall or trusted to be of the lead. The dog that doesn’t like other dogs has not been socialised properly and keeping him away will only make matters worth. The dog that is frightened is so ‘protected’ by the owner that his fear is compounded by every experience where his owners pushes other dogs or people away by their actions. Again, this is a recipe to strongly reinforce the dog’s fearful behaviour. Nearly all of the people I meet while out with my dog that recount variations of the examples above have been to trainers and behaviourists. Unfortunately, some are given bad advice but, I am sure, others give good advice backed up with a plan of action to be followed to help the dog. REMEMBER — the importance of taking time and resisting the urge to rush or miss out steps is critical for success. Many people have a reasonable idea on the things they need to do, having taken advice. However, at the first sign of difficulty such as the dog disappearing into the woods, they give up and take the easy route. 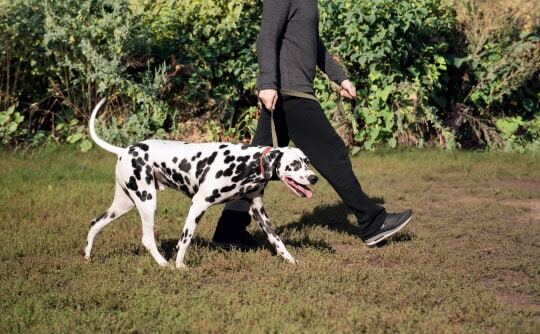 Keeping the dog on the lead makes THEIR life a lot easier — right? That might be the case, but for your dog it is, simply, failing them and denying them a full and rich life of exercise and socialisation that they deserve. So, if you have taken the time to seek out professional help because you want the best for you and your dog, follow the advice you have been given. Take the time to do it properly and consistently. Do not be tempted to cut corners or, to give up because it’s difficult for you. You owe it to your dog to work at it and do it right.